As the threat of new gases and more destructive chemicals grew stronger, the chemists' secret work in the laboratories transformed into an explosive fusion of steel, science, and gas on the battlefield. 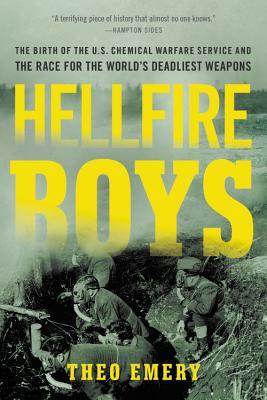 Drawing from years of research, Theo Emery brilliantly shows how World War I quickly spiraled into a chemists' war, one led by the companies of young American engineers-turned-soldiers who would soon become known as the "Hellfire Boys." As gas attacks began to mark the heaviest and most devastating battles, these brave and brilliant men were on the front lines, racing against the clock-and the Germans-to protect, develop, and unleash the latest weapons of mass destruction. Theo Emery is a journalist who has written for the New York Times, the Associated Press, the Boston Globe, the Washington Post, the Tennessean, and other publications. He has appeared on NPR and WBUR in Boston. He graduated from Stanford University in 1994, and earned an MFA in Creative Nonfiction from Goucher College in 2014. He was a 2015 Alicia Patterson Foundation Fellow. He lives outside Washington, D.C.